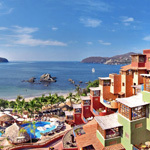 Peaceful and tranquil, Zihuatanejo is a rare jewel on the Mexican Riviera. It's nestled between mountains covered with lush palm trees and the golden shores of the Pacific Ocean. Because of its unique geography, Zihuatanejo has remained off the beaten path, and manages to preserve its authentic way of life today. Local fishermen can still be seen bringing in their early morning catch, hopeful for a sale at the lively markets. 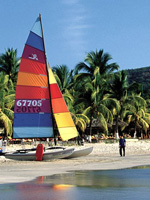 Playa La Ropa's half-mile crescent-shaped beach is dotted with cantinas, palapas and restaurants. The old Mexico-style streets of the nearby village are lined with shops, restaurants and the colorful works of local artisans. Both day and night are filled with countless recreational options – from scuba diving to parasailing to dancing and more. Zihuatanejo is an authentic fishing village, just 20 minutes outside Ixtapa and two hours from Acapulco. Even if you've been to Mexico countless times, you've likely never experienced it quite like this. Club Intrawest — Zihuatanejo, situated on the exclusive shores of Playa La Ropa, features Vacation Homes with large terraces with sweeping views of the Pacific Ocean, private plunge pools, and open–air design with seamless transition from indoor to outdoor living. The resorts on-site infinity pool and three unique dining experiences also provide great opportunities to enjoy this tropical destination. Situated on the exclusive shores of Playa La Ropa, Embarc Zihuatanejo is an intimate oceanfront retreat. A series of terraces and cascading pools spill toward the infinity pool and beach below. The resort's design is inspired by the surrounding landscape; interiors blend seamlessly with private outdoor spaces, all providing breathtaking views of the Pacific Ocean. The charm of Zihuatanejo's original Mexican fishing village is interpreted through indigenous materials including hand-cut tiles, palapa roofs, and textured fabrics with punches of color. Everything here has been created by a collection of true artisans, handcrafted with attention paid to the smallest details. From tile motifs to ceramic sinks, the architectural design is entirely unique. Members enjoy attentive personal service, palapa bars and an on-site restaurant to sample the tastes of the region. A rooftop sunset bar and bistro with authentic Mexican music completes the ambiance. Spend lazy days at the pool, pamper yourself with a massage, and watch the kids play on the beach.